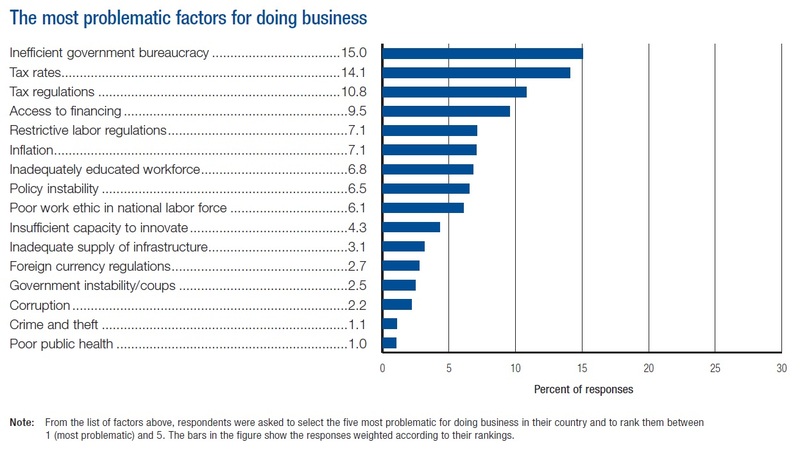 The World Economic Forum just released their global competitiveness ranking and the good news is the U.S. is still in the top 10, number 7 to be precise, just behind the Netherlands and Germany. The bad news is that’s 2 places lower than last year, and 6 places lower than in 2008 when the U.S. was the most competitive economy on earth. America’s least competitive areas include taxes and government debt. The U.S. ranks 69th, right behind Ethiopia, in terms of the impact taxes have on incentives to work and invest. The U.S. ranks 103rd of 144 countries in terms of the total tax rate as a percent of profits.